Will Salley and Savannah Salley of Headwaters Market Garden use a unique French method of bio-intensive vegetable production on small acreage. Currently in their first year of full-time farming, they have wholesale and restaurant accounts. They will return to the downtown Asheville City Market in the Spring, to host a booth on Saturday mornings. Next year, they plan to expand their operation with mushroom and egg production. At the Carolina Farm Stewardship Association’s Sustainable Agriculture Conference — a regional conference for NC & SC — our Community Farm and Food Associate Chris Link and farmer Will Salley participated in a panel discussion about farm incubator programs. Our Farmer Incubator Program is one of only two such programs in the nation owned and operated by land trust staff. Our geographic location in the mountains, diversification of agricultural enterprises, environmental focus, and emphasis on public education also set our program apart. Land access remains one of the biggest hurdles faced by farmers, and as a land trust with a history of successful farmland preservation we are well situated to help address these challenges. This year we again partnered with KD Ecological Services to rotate a herd of goats through 3-4 acres of the farm, removing invasive kudzu and brush to help return a portion of the farm to productive pasture. This year we split up the herd and rotated more frequently, at strategic times of growth for invasives, to test new methods for efficiency. These charismatic, friendly goats are always a hit with volunteers and visitors! The French Broad River Academy (FBRA) has a long-standing partnership in performing service work with SAHC. This fall both the FBRA boys and girls participated in service learning hours to make our Community Farm healthier and more successful. The spirited 6th and 7th grade girls came out to the farm on two separate days in November. 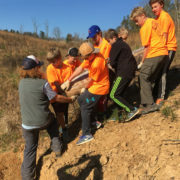 The 7th graders sang and danced while they worked in the shortleaf pine restoration area, prepared garden beds, and strung up a caterpillar tunnel. The 6th graders wrote a news article about their workday in the vegetable garden. FBRA boys created four water bars on our Discovery Trail and seeded the stream restoration area and sides of the trail system with native grasses for slope stabilization, to protect water quality. We are grateful for all the work the FBRA students have put in at our Community Farm!